Neil MacCormick was born in 1857, the fourth son of Alexander and Cathrine MacCormick, tenants of Baligarve. He made his living first as a tailor and was still living at home at Baligarve, aged 24 at the 1881 census. In the following decade he married, moved to Baleveolan, and, by 1891 he was described as a “tailor, clothier and general merchant”, employing 2 journeymen and an apprentice. Highly entrepreneurial, and prospering from a contract to supply uniforms for the MacBrayne steamers, he built Daisybank House behind Lismore Stores in the 1890s. The tailoring business did not survive his early death in 1902, but his wife, Elizabeth MacCormick, continued as a general merchant until she sold the business to Duncan Colthart, who also operated in Oban. The MacCormick shop accounts from 1906 to 1935, and a range of other business papers are held in the archive at LISDD:2009.M (The Daisybank Papers). They were kindly donated by Neil’s descendants when they sold the house. In 1944, young Margaret Livingstone from Laggan started as shop assistant, not knowing that she would continue there for 30 years. Her story of the hard physical labour, carrying heavy weights, dealing out bulk materials, and long hours in the van, is told in the museum audiovisual presentation: Toradh an Lios. 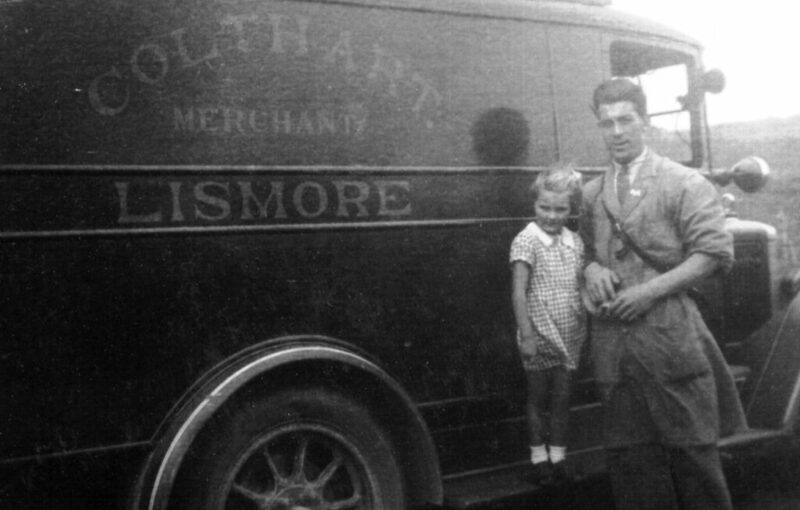 From 1949, the shop was managed for the Coltharts by Jim Corrigan, seen below with his other assistant Jessie Stewart. In the ‘sixties, the business was taken over by Richard Holyoak, and the island Post Office was transferred from Achnacroish to Lismore Stores in 1969. 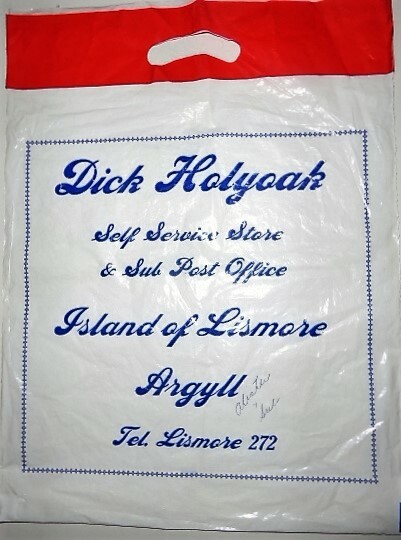 The Holyoak years are remembered as the time of modernisation of Lismore Stores: self-service and supplying plastic bags (which are now considered to be “collectors pieces”). This bag (LISDD:2015.217) was brought back to the island from British Columbia by Sue Morham, who found it in a trunk in her uncle’s house. 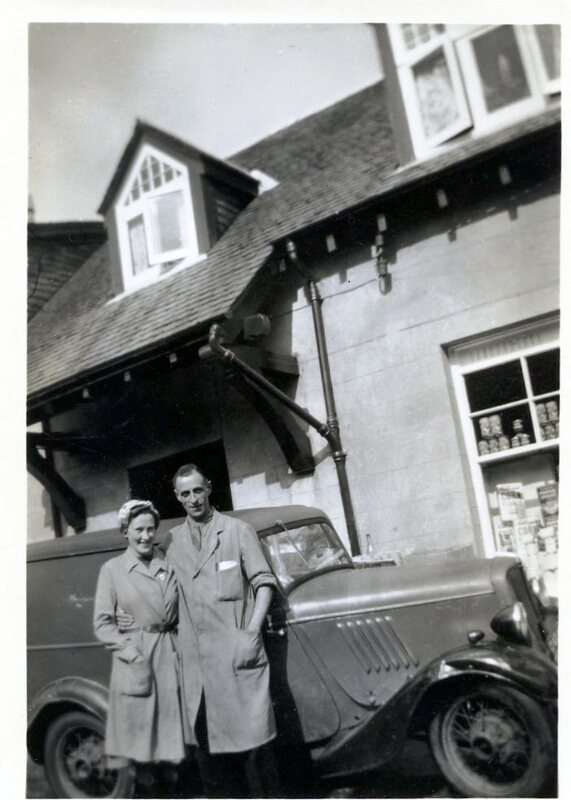 The next shopkeepers, Pat and Geoff Taylor, continued up to 1997, when David Wilson took on the crucial role of maintaining the island shop and post office.